Saturday, March 30 at 2:15 p.m.
Friday, March 29, 2019 4:45 p.m.
Saturday, March 30, 12 p.m.
Two local film and music luminaries, Jim LeBrecht and William Ryan Fritch have an organic discussion about composing for documentary films, including how music and sound contribute to the “voice” of a project, create connections between film elements and foster emotional bonds to the story being told. Jim and Will not only speak to the function of music in film, but also to the ins-and-outs of the collaborative process, including how to develop a common language around music in film and deepening the relationship between filmmakers and composers. William Ryan Fritch is a Petaluma-based composer, multi-instrumentalist, engineer, and producer who has contributed music to over 100 documentary and narrative films, including at least 5 featured in our 2019 program: Dust Rising, From Baghdad by the Bay, Circles, The Worlds of Ursula K. Le Guin and The Rescue List. In addition to scoring and contributing music to a number of award-winning films, Will’s work has also been featured in a number of prestige limited series for media outlets like Netflix, HBO and PBS. He has also maintained a prolific life as a recording artist, releasing more than 30 solo albums of his unique amalgam of folk, contemporary classical, and experimental music through the boutique label Lost Tribe Sound available on Vimeo, Sound Cloud and Band Camp. Will has a surprising number of instruments and he is not afraid to use all of them! Producer/Director Jim LeBrecht has over 170 film credits and 40 years of experience as a film and theater sound designer and mixer, in addition to his work as an author, disability rights activist, and filmmaker. Jim is the founder of Berkeley Sound Artists (BSA), an audio house that specializes in post production audio for documentaries that has operated for over 20 years, and done work on many vaunted projects, such as the Academy Award-winning The Blood of Yingzhou District (Ruby Yang, 2006) and Emmy and Academy Award nominee, 4.1 Miles (Daphne Matrziaraki, 2017), which he worked on with Will Fritch. Jim has contributed to a number of films in this year’s festival, including The Pushouts, Bathtubs Over Broadway and From Baghdad to the Bay (another credit he shares with Fritch). In addition to his work in film, Jim has also worked in sound for a number of video games, and produced and directed the upcoming project Crip Camp about the lives of those who attended a summer camp for disabled teens held just down the road from Woodstock in the late 60s/early 70s. Jim is a member of the Academy of Motion Picture Arts & Sciences and was added to SF Film’s Essential List, honoring Bay Area film luminaries in 2017. LeBrecht has also published articles on sound in documentary, and given master classes in sound design for institutions like the International Documentary Association. For tickets to Composing for Docs, click here. Sound Designer and Composer Kent Sparling of Skywalker sound will discuss how archival audio, authentic location sound, added sound effects, designed sounds, and music coalesce to surreptitiously support the emotional impact of a film and help to develop its themes. Since beginning at George Lucas’s Skywalker Sound in 1997, Kent has worked as a sound designer and re-recording mixer on an array of projects. While he has credits on many prestige films like Sofia Coppola’s Lost in Translation and Marie Antoinette, and Spike Jonze’s Adaptation and her, and huge blockbusters, such as Star Wars: Episodes I and II, Hellboy and Cars, his deep ties to independent cinema are exemplified by his work on films like Ballast, Miranda July’s The Future, Braden King’s Here, Lance Edmands’ Bluebird, and David Lowery’s, Ain’t Them Bodies Saints. Similarly, his documentary credits are widely variegated, including intimate portraits and films that address large-scale social justice and environmental topics, from recent works such as PJ Raval’s Call Her Ganda, Bonni Cohen and Jon Shenk’s An Inconvenient Sequel: Truth To Power, Vanessa Hope’s All Eyes and Ears, and Ryan Suffern’s Finding Oscar to work with enduring significance, like Heather Ray’s Trudelland Michael Moore’s Sicko. In addition to garnering industry accolades, Kent was a composer fellow at the 2014 Sundance Music and Sound Design Labs for Documentary, was nominated for both CAS (Cinema Audio Society) and MPSE (Motion Picture Sound Editor) awards for An Inconvenient Sequel: Truth to Power, and was added to SF Film’s Essential List, which celebrates Bay Area-based filmmakers. In addition to his work on film, Kent has continued to prolifically produce music from the two record labels runs: Purling| Susurrus, which releases experimental electroacoustaic music and Mighty Prawn, which specializes in good pop, which are available on his web site, Sound Cloud and Band Camp. He’s also the co-creator of the Nocturne podcast. For tickets to The Hidden Layer, click here. 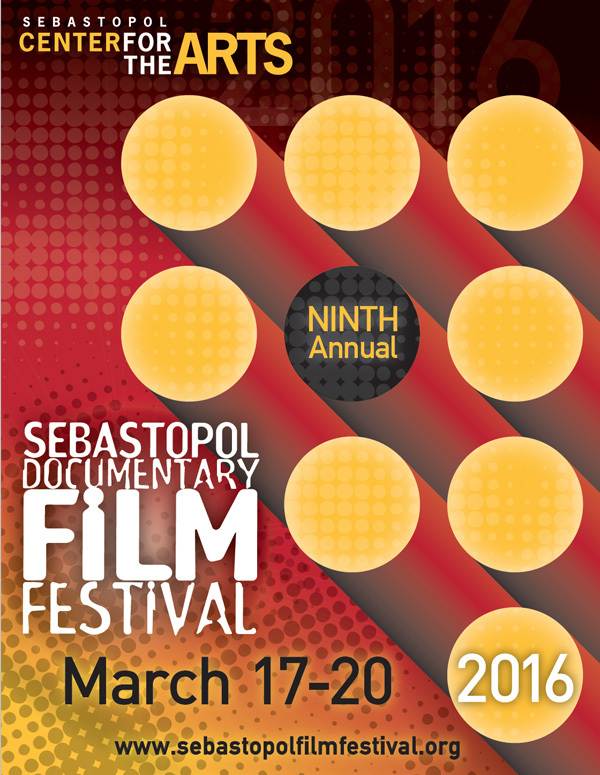 Each year on June 1, the call for entries opens for Sebastopol Documentary Film Festival. This year our screeners and programmers watched over 400 films … some multiple times. If there was one abracadabra we could activate in the filmmaking universe it is this: Cut, cut, cut that film to save it. Vivien Hillgrove has done just that in her remarkable career. Here are a few films Vivien’s skills and intellect have enhanced over the years: Henry & June, The Unbearable Lightness of Being, Blue Velvet, The Mosquito Coast, and The Right Stuff. Vivien’s documentary credits include seven films by Lourdes Portillo including La Ofrenda: The Days of the Dead, The Devil Never Sleeps, Senorita Extraviada (Sundance Special Jury Award and IDA winner) and Corpus: A Home Movie for Selena; In the Matter of Cha Jung Hee (Asia Pacific Film Festival Best Editing Award); The Future of Food and Symphony of the Soil for Lily Films; and Music Editor for Broken Rainbow (Academy Award 1986), for Earthworks. She has served as an editing advisor at multiple Sundance Institute Documentary Composer Edit Labs, as well as for the Latino Producers Academy (NALIP) and for Chicken & Egg Pictures. Vivien is always a generous mentor to the filmmaking community; we can count on a lively, informative afternoon. How has the Russian government covertly influenced public opinion in the U.S. and around the world? Factory of Lies (Jakob Gottschau, 2018) tells the story of a team of Russian investigative journalists who have dedicated themselves to uncovering tactics used by their own government in information wars that are shaping politics across Europe and the U.S. In addition to providing a unique perspective on “fake news” in the 2016 U.S. presidential election, Factory of Lies gives context and history for this new and always-evolving form of “information warfare.” The film also offers a rare glimpse into so-called “troll factories,” as well as how and why young Russians have found themselves producing fake news from fake profiles. It also highlights the intrepid investigative work of BBC Russia’s Andrey Soshnikov and Roman Dobrokhotov, Editor-in-Chief of The Insider, an online magazine dedicated to journalistic investigations with an “anti-fake” project focused on Russian propaganda’s infiltration of news across Europe and the United States. Factory of Lies is the work of filmmaker Jakob Gottschau whose prior projects include the 2015 film facebookistan, which interrogates the ways in which the social media giant’s “laws,” power and influence have impacted privacy and freedom of expression. Gottschau will be present to introduce the film and field questions after its screening and during the Investigative Journalism Panel set to follow the film. Following our screening of Factory of Lies, a film that explores the powerful intersection of social media and propaganda, SDFF presents a special panel discussion with Pulitzer-, Peabody- and Emmy-winning journalist Lowell Bergman. Bergman explores the rigorous processes common to both journalists and documentarians who set about finding the truth, letting the story be their guide and preserving those kernels of fact to which we can return. Having worked across platforms in both print and broadcast journalism for over 30 years, Bergman is perfectly positioned to provide insight into the current crisis in truth and fact, which has had widespread and increasingly serious impacts on everything from electoral politics to looming global environmental disaster. In addition to working on everything from The New York Times to Frontline and 60 Minutes, Bergman founded the Investigative Reporting Program (IRP), a professional newsroom and teaching institute at the University of California, Berkeley. Recently, Bergman and IRP Director John Temple developed another innovation, Investigative Studios, a non-profit production company. Their inaugural production, Who Killed Lt. Van Dorn? premiered in October last year. The year is 1996 and documentary filmmaker Doug Block, fascinated by this new thing called the Internet, trains his wry, analytical lens on the burgeoning home page (i.e. blogging) phenomenon. He soon falls under the thrall of 21-year old cyber superstar Justin Hall, whose (literally) bare-all online diary spares no details about friends, family, lovers and, inevitably, Block himself. When Hall goads the filmmaker into keeping his own online diary, the story takes an unexpectedly personal turn, with humorous, sometimes disquieting, and deeply affecting results. This special 20th anniversary re-release reveals Home Page to be be a prescient historical document of the power of connectivity in an increasingly narcissistic, confession-crazed culture that has become nearly ubiquitous in the social media era. Home Page was nominated for the Grand Jury Prize at the 1999 Sundance Film Festival, and named one of the year’s best documentaries by The Chicago Sun-Times. During the making of Home Page, director Doug Block created a personal blog he called The D-Word (www.d-word.com) to share in real time his process of making the film. When Home Page went into distribution in 1999, Block re-launched The D-Word as an online discussion forum and community for documentary professionals worldwide. Now celebrating its 20th year, The D-Word includes over 16,500 members from 128 countries. This celebration of both the film and the web site includes a screening, a Q&A session with filmmaker Doug Block and an after party! For tickets to the D-Word, click here. This program begins with three visually accosting and distinct short films about fishing in three very different locales; Waterfolks (Hangam Island/Iran, 30), Haenyo (South Korea/Jeju Island 6) and Lucas’ World (France/Corsica, 16). The films tell their stories in unique and wildly variable styles, from the poetic to the observational. The screenings will be followed by a discussion with Mischa Hedges of Trim Tab Media and director of the award-winning documentary, Of The Sea (United States, 2016). Lucas is a young fisherman from Corsica who has just been hired. He works with his boss to catch bluefin tuna off the coast of Corsica. In the middle of the Mediterranean, he practices his future work of capturing and killing these noble animals. Sakineh and Sobra are two of the many fisherwomen of Hangam Island in the Persian Gulf. They go to sea every day to support their families. This film is a close-up of their daily life at sea and on shore. No narration is needed as their story tells itself through stunningly beautiful images. Won best short documentary film from Cinema Verite Tehran. This film focuses on the life of the Haenyo, the diving women of Jeju in South Korea, with seven idiomatic expressions from the island. The animated sketches also highlight the musicality of the spoken language.